I’m not really a backpack kinda girl. Instead I prefer a chic handbag, stuffed to the brim with useless items, just in case. I’m currently still dragging my trusty DVF Harper bag around with me which is now starting to look a little weathered. I like the beaten up look. Both in bags and men actually. Anyway, I’ve been searching online for backpacks and not finding any I liked other than the Ashish X Topshop one, which for a couple of hundred quid I’ll never be able to afford. 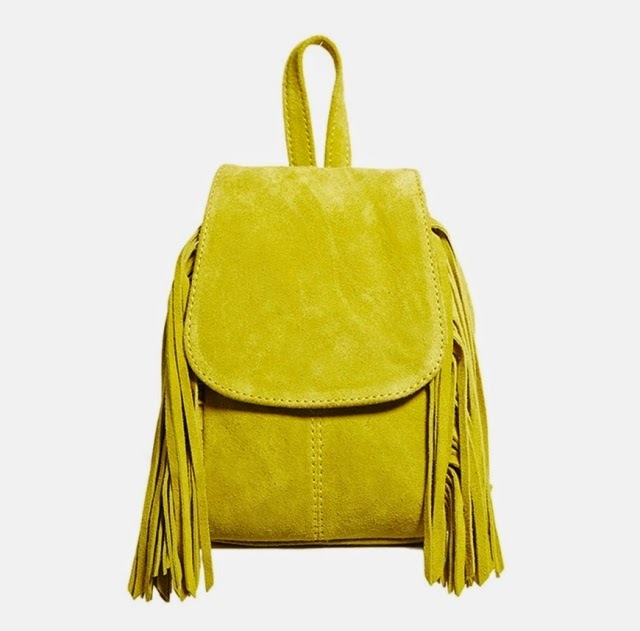 This ASOS Suede Mini Backpack with Fringing made me stop what I was doing and close all the other tabs I had open. It was the one. First of all, let’s just take a moment to appreciate the colour. It’s bright yellow with a green undertone. Secondly, check out the fringing. The fringing could sell me on this bag alone. It is heavenly. I also love how it’s not too big. I mainly want it for Latitude festival so I can carry my essentials and have enough room for extra layers of clothes. It’s just a complete beaut. I know I’m on a shopping ban, but this is surely counted as an essential purchase. Surely?